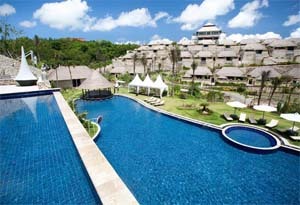 One of the remarkable private pool hotel located in area of Nusa Dua. This luxurious resort stay on the top of the Nusa Dua hill embracing the amazing landscape especially in the night when the lights are glowing colorfully. Experience the stay at the most fabulous Bali villas in the island. Far away from the hustle and bustle of the city, the Ocean Blue Hotel Bali is a peaceful villa retreat in Bali. It could be easily accessed from Ngurah Rai International Airport for about 25-30 minute driving. Besides that, some shopping, entertainment, and dining venues could be reached in only 20 minutes. Ocean Blue Hotel Bali offers 141 stylish villa rooms which are designed with the perfect combination of Balinese traditional style and modern touch. Each villa provides a private pool and “bale bengong” (Balinese traditional gazebo) set within a beautiful garden environment, separate living room, elegant bedroom with canopied bed, and luxurious bathroom with Jacuzzi. For your dining, Pomelo Restaurant is ready to serve you with the selections of Western, Japanese, Korean, Chinese and Indonesian cuisines or enjoy your evening at the Wine Bar. The restaurant serves breakfast, lunch, and dinner with kids menu are also available. The spa service will be handled by the professionals from The Divya Spa. This spa opens from 10 in the morning until 10 at night with an in-room treatment service is available upon request. There are various spa treatment packages such as Tropical Bliss, Warm Stone Massage, Balinese Massage, Traditional Facial, Manicure, Pedicure & Nail Arts, and other packages which are provided for your body and soul rejuvenation. This hotel also offers many selection of meeting venues, from regular meetings, social events to product launches or corporate-wide celebrations. Accommodating and helpful staffs would be glad to assist you and ensure that whatever you events are, they are done successfully. Big rooms and wash/bath room bigger than the bedroom but villa and the whole hotel property requires renovation to be up to date. It lacks hotel amenities as what other hotel gives and it does not provide intercontinental breakfast. However it is value for money, as you get what you pay for. I stayed at this hotel with wife, we took 3d2n the honeymoon package during August 2012. Actual room quality was far from the images shown at the internet..this hotel needs renovation..
me & my wife were so disappointed at the dirty toilet, unqualified breakfast provided (for 5 star hotel), dirty private pool, much even dirtier public pool..
Will never come back/recommend to friends..
for those have not stayed/willing to stay at this hotel, please note that the pictures on the internet are taken years ago when the hotel was built..its not like that now..